First Listen: Viet Cong, 'Viet Cong' The band's frigid, deafening, brutalist post-punk nods toward experimentalism. A massive production, Viet Cong's self-titled debut culminates in a furious bonfire of rage and release. Viet Cong's self-titled album comes out on Jan. 20. 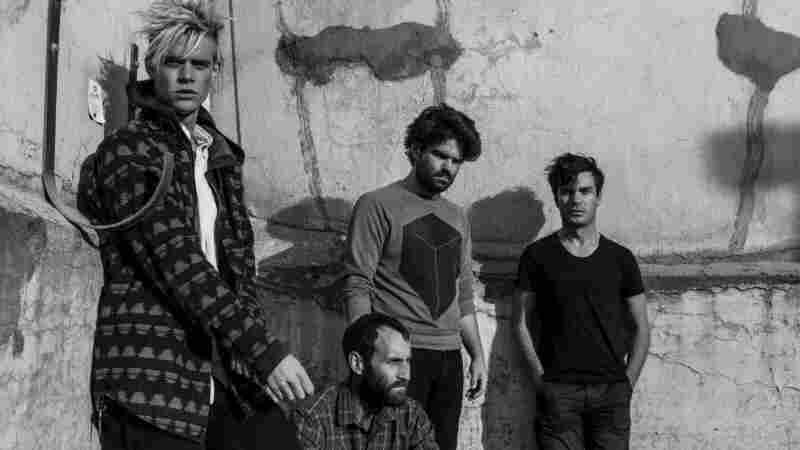 Two miserable experiences hang heavily over the band Viet Cong. First came the acrimonious dissolution of Women, of which bassist Matt Flegel and drummer Michael Wallace were members. Not long after came the death of that band's guitarist, Chris Reimer. Both of Viet Cong's records — last year's Cassette EP and this self-titled full-length debut — labor to process grief and move forward from its grip. Cassette weaved its way through several carefully donned styles before letting the bottom drop out into dark, aggressive rock. But this album enters that cavernous space outright and stays there for its duration, as Viet Cong finds its own way through the surrounding bleakness with frigid, brutalist post-punk that nods toward experimentalism. Tracks like "March Of Progress" conjure the church-chanting vocals, paint-stripping guitars, jarring transitions and rhythmic fearlessness of This Heat. Along the way, they focus on the concussive drumming and industrial drones that closed out Cassette before shifting gears twice more: first into a vaguely Eastern passage of tinny, treated melody, then into a piercing coda in which forlorn words are connected by a kick drum. The abrasiveness carries over to slowly mutating, mechanically resolute works like "Bunker Buster," which pounds away at a steady pace as the guitars lash everything that surrounds them. Elsewhere, Viet Cong plies the sort of moody, windswept rock perfected in the '80s by bands like Chameleons U.K. and Bauhaus. It's all chilled blood and high collars, with durable, ice-scraping riffs that bend at right angles and vocals that belie a teenage history growing up Goth. Synths glide over the howling chorus of "Silhouettes," as well as the massive well of melancholy that powers "Continental Shelf." These two approaches culminate in the 11-minute "Death," which can be read as nothing less than a tribute to Reimer's legacy. The song plummets from a high-perched hook and artillery-grade drumming into a thrashing sea of noise and an arrhythmic dirge, its intensity unmatched on this already-stressful record. At no point does Viet Cong ease up on the pressure; this is its mourning period, as the massive production culminates in a furious bonfire of rage and release that's stunning in its scope. The year is too early to call, but if more records match Viet Cong's restless moods, there may not be much left of us come December.